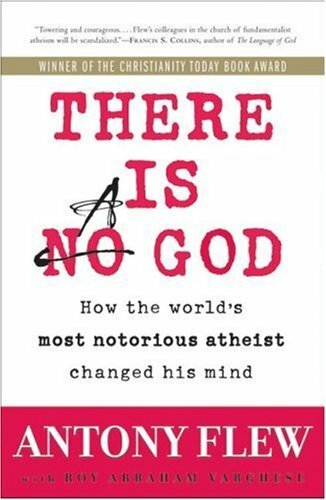 I’ve been reading Anthony Flew’s There Is A God which chronicles the author’s journey from one of the world’s leading atheists to becoming a theist. I remember as a young man reading portions of the Encyclopedia of Philosophy of which Flew was the editor. A skeptic might say, “Ah… he’s just getting old and scared.” Yet Flew’s own claim is that what changed is mind is the world picture emerging from modern science. Flew sees three ways in which modern science points to God. First is the fact that nature obeys laws (e.g. gravity). Second is the existence of “intelligently organized and purpose-driven beings” which are clearly more than mere matter. Third is the very existence of nature itself and the unlikelihood of this something coming from nothing. If you are seeking truth this might make a great read regardless of your current worldview persuasion. For my Christian readers, if you had to list the top three reasons you are a Christian, what would they be? For my non-Christian readers, how would you describe your current worldview, and what are the top three reasons you are so persuaded? This entry was posted in Religion and tagged atheism, worldview on September 26, 2012 by Steve Godfrey. The testimony of the Holy Spirit is the reason I’m a Christian. It’s great to see There Is A God getting some play, I read that book and loved it. Thanks much for commenting. For me the linchpin is the historicity of the resurrection of Jesus. Anthony Flew’s conversion to deism was surprising to most atheists, I think, but to focus on his conversion is to cherry pick evidence. I’m not saying that your intention was to hold up this one example as evidence for theism, but Dan Barker, a former Pentecostal minister has a book called Godless, where he explains how he changed his mind after learning more about modern science. Barker, in turn, outlines the ways in which modern science obviates the need for God. So, just as prominent atheists can take up theistic worldviews, theists can can abandon their theistic worldviews and become atheists. What makes Anthony Flew’s story so intriguing was how avowedly he lacked a belief in God only to change his mind, and indeed how eloquently he chronicles his journey. But as an atheist, Flew was not immune to specious reasoning and fallacious arguments. And ultimately, his arguments for a universe designed by God is flawed. To answer the question, religions like Christianity serve the purpose of explaining the natural world. Yet, they lack the explanatory power that science can offer. When theists invoke arguments by design as Anthony Flew did, they often fail to recognize that invoking a supernatural deity is not a viable explanation. We are still left wondering the mechanisms of /how/ God created the life, the universe, and everything. In attempting to explain how the world works, Intelligent Design supporters invoke the argument of irreducible complexity in particular to dispute the theory of evolution. Curiously, that argument takes us further away from understanding the natural world because if the complexity of creatures that follow predictable, observable, natural laws is too complicated for scientists to understand, how can we hope to understand the infinite complexity of an ineffable yet personal, transcendent yet immanent supernatural being like God? Oftentimes, ID supporters may make the claim that God uses natural selection as a way to guide evolution by His divine plan. But the principle of natural selection and the theory of evolution do not require a supernatural designer; we can account for the diversity of life on Earth without having God guide the process. And since science is guided by the Occam’s Razor, the simplest answer is preferred. By invoking a need for a God, we’re not just adding a new element to an existing ontology or even replacing an old ontology with a new ontology of similar complexity, we’re adding an entirely new (and superfluous) metaphysical category that does not even fit into the natural world. And to be clear, it’s not that I reject the existence of God based on Occam’s Razor, it’s just that the existence of God from the argument by design becomes a dubious claim that theists have yet to substantiate. One other argument that I have found to be unpersuasive is the argument from incredulity. Oftentimes, theists will make the claim that the universe /must/ have been created by a personal intelligence because they can’t understand how it couldn’t have been. Just because something is as-of-yet unknown to someone with a limited imagination, does not make it false. I may not understand the physics behind the process of nuclear fusion in stars, but that doesn’t mean God is a viable alternative. Similarly, scientists may not be able to understand origin of the universe before 10^-43 seconds yet, but that doesn’t mean God has to be involved to explain the origin of the universe. The absence of evidence is not evidence of fiction. In the argument for God, absence of evidence is not necessarily evidence of absence, but until solid evidence is presented, there is not enough justification for my belief. The argument from incredulity is oftentimes paired with the false dichotomy that because science doesn’t have the answer to the meaning of life, the universe, and everything, that by default Christianity must be right. There are two problems I see with this argument. First, there are more than two options. Just because science doesn’t have the answer doesn’t mean Christianity /is/ the answer; it is equally likely that the teachings of Islam, Judaism, Sikhism, Jainism, Hinduism, Buddhism, Zoroastrianism, could be true. And second, science is not just a body of knowledge, it is a process by which we uncover new information. Every day, scientists make new discoveries about the nature of existence and with every new discovery, the realm of the supernatural shrinks a little bit more. There was a time when rainbows, lightning, and certain diseases were attributed to the divine will of God, only so that scientists could unearth the natural laws actually at work. If God is defined as a pocket of scientific ignorance, then every discovery makes God a smaller and smaller part of our lives. And I suppose that’s where my lack of belief comes from. I can explain the origin of the world and how it works better without God. I admit that I don’t have all of the answers, but I’m committed to seeking them. I believe Insight into how science works is not sufficient to greater understanding of reality, but it is necessary. Thank you for sharing your thoughts. I enjoy interacting with fellow travelers on the search for truth. Do you find Flew’s reasoning specious on scientific grounds, philosophical grounds, or do you consider these synonymous? My own thinking is that science can tell us much about what and how but not much about why. Why are we here? Granted, this is a philosophical question versus a scientific one but important to ask. Flew was not a scientist, so he may not have had the background in molecular biology or astrophysics necessary to be able to judge the merits of certain scientific arguments. Overwhelmingly, scientists who understand the process of evolution (either biological or cosmological) strongly agree with their conclusions; namely that the accumulations of minor changes over long periods of time can lead to more ordered systems and indeed can account for the complexity we see in nature. His arguments are most definitely specious on scientific grounds, and I would disagree with his claim that it is more likely that God exists because it’s more likely that God would be uncaused rather than the universe (and that we can argue for the existence of God from the existence of the universe). Our understanding of quantum mechanisms shows that there are indeed uncaused events on a quantum level. Furthermore, we can observe uncaused events on a macro level. The radioactive decay of heavier elements into lighter elements is governed by quantum mechanics and this is an example of how the quantum mechanical world is observable to us. If you have an hour to kill, check out this video by Lawrence Krauss. He has a book called “A Universe of Nothing”. You can find a copy of it on Amazon.com, but Krauss also gave a lecture on this topic back in 2009. Go ahead and skip the first few minutes. Nothing productive is said. He pokes fun at theists and doesn’t get started until on any anything important until later. The lecture goes on a bit long, so I would suggest in particular that you jump to 19:00. You should watch the whole thing if you have time, but the main point of his lecture starts around 20:45. Basically, the theory of quantum mechanics suggests that scientists may not need to invoke God in order to understand the origin of the Universe in the Big Bang. Intelligent life arose the way that it did because of the laws of nature in our universe. Furthermore, Krauss suggests that the laws of nature arose the way that they did because of the way our universe came from nothing. And he concludes by suggesting a universe will inevitably arise from nothing so we may need to adjust our understanding of the word “nothing”.